Designing user experience for connected devices was one of the most challenging works I've ever done in my career. With the Lead User Experience Designer and Creative Director, I designed a myriad of digital and physical solutions for the millions of our Neighbors. This is actually my hand, photographed by Micah. My hand is now in every Chime Pro manual and worldwide famous! There is nothing more important than the first time experience. For cars, it's the first time you get intimate with the steering wheels. For phones, it's the first time you feel the slab out of a brand new box. For doorbells and cameras, it's the first time you see the front door and backyard from your phone. That's our "Wow!" moment for our Neighbors - whether you answer an Amazon delivery or show it off to your family at a holiday gathering. For our products to achieve that, however, we humbly ask users to do the heavy lifting - the installation. Like assembling an IKEA furniture, this is the most cumbersome part of our user experience. That being said, our design team's primary objective is to make our Neighbors feel smarter with a better design. The following is a set of setup flow designs that reflect our intention. One of the most common user feedback the team received was its performance issue due to a poor WiFi connection. Since the hardware is installed outdoor, the performance of WiFi can drastically decrease outdoor, compared to the one at an indoor environment. To provide a better user experience around this challenge, we designed digital solutions as well as physical solutions for our Neighbors. The following is a couple of examples on how we help and educate our Neighbors about WiFi connection. While setup flow was still the biggest user flow in the Ring app, there were many other challenging flows that required delicate attention from the design team. With better interactions and animations, we prioritized reducing the friction and confusion for our users. The following is a set of user flow interaction examples I designed. Designing a connected device user experience is a multidisciplinary practice that requires a lot of technical knowledge. As a designer, I battled countless error states, loading states and feedback states every day. How does the device settings page appear when the device has no battery or is offline? How does the live and recorded videos load if your phone has no internet connection? 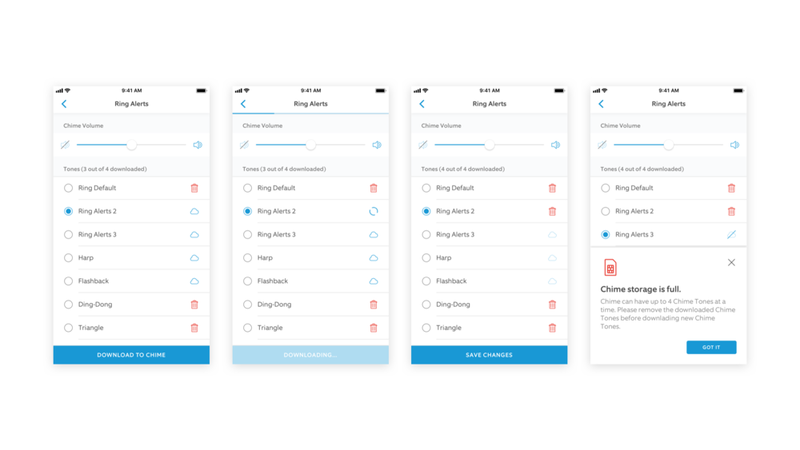 How many ringtones can you save in the RAM inside the Chime? The following is a set of examples on those hardware-software integration designs.